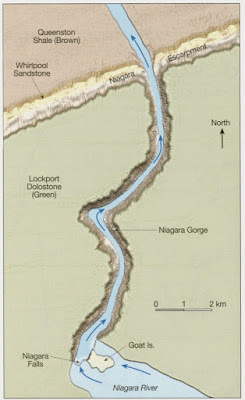 In my previous post, Niagara Falls Erosion - Part I, I discussed the geologic setting of the Niagara Escarpment and how the average rate of erosion of the falls since the last Ice Age has been about 3 feet a year. This is based on the total distance of movement of Niagara Falls from the Niagara Escarpment since the last Ice Age. Today I'll look at this in a little more detail. The first accurate survey of the exact position of the falls was done by the famous New York State geologist James Hall back in 1842. In 1905, Grove Karl (G.K.) Gilbert, who worked for the United States Geological Survey (USGS), studied the rate of recession at the falls since Hall's measurements by resurveying the falls, and came up with an average rate of 5.3 feet/year (about 1.6 m/yr) - read his report here. This rate, however, drastically slowed over the 20th century. The building of huge hydroelectric power plants in both the U.S. and Canada means that anywhere from one-half (daytime) to two-thirds (nighttime) of the water in the river about Niagara Falls is diverted away for power generation. Today, the average rate of erosion is estimated to be less than 1 foot per year (0.3 m/yr). 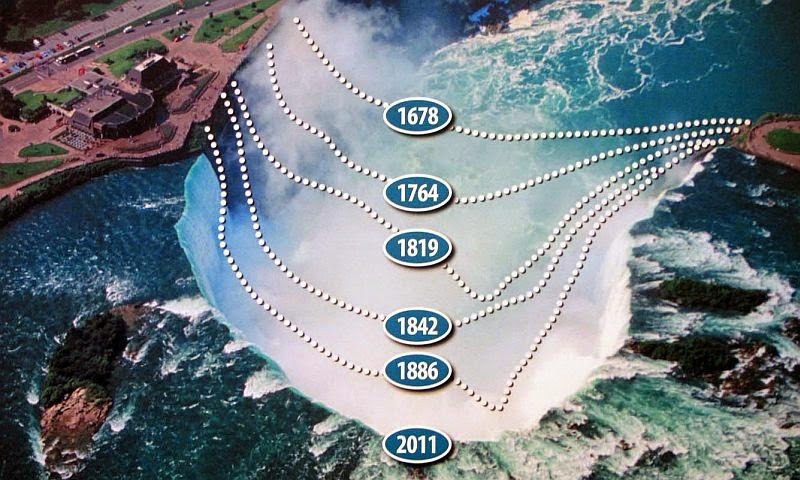 Here's a diagram showing erosion of the Canadian Horseshoe falls over the past few hundred years (both estimated and directly measured). It's noticeably fast. As you can see by looking at a map of the falls (or an aerial view), the reason there are two waterfalls currently is because the falls have intercepted Goat Island with the Canadian Horseshoe falls on one side and the American falls on the other. Prior to 600-800 years ago (depending on the exact rates of erosion), there was only one waterfall on the Niagara River. In a couple of thousand years, after erosion moves the waterfalls up past Goat Island, the two falls will again merge into one (really, what will happen is that the Horseshoe falls, which is eroding much faster will move past Goat Island leaving the slower American Falls behind, high and dry). After about 15,000 years, the falls will have moved far enough upstream that it will lose the resistant caprock, only cutting through shale (Salina Shale). This will turn it into a series of rapids and we'll lose the spectacular waterfall (well, we'll all be dead, but our descendants, assuming humanity is still around, will lose the falls). Thank you for this Niagara Falls series. It was helpful and appreciated.